After Jack Blumenthal retired from a successful 35-year career as an engineer, he decided to pay it forward by teaching mathematics at Mayfield Senior School in Pasadena. “I thought, I’ll come here and spend a year or two and that will be the end of that,” Jack, 81, recalled. Two decades later, Jack is still enjoying the vocation that allows him to share his skills in science, technology, engineering and math with the ladies who attend the all-girl’s campus. “I had always thought that women were badly underrepresented in the engineering and physics fields, and an all women’s school was a good place to try to encourage the young ladies to think about engineering,” Jack said. His efforts have inspired a new generation in which young ladies under his tutelage are entering careers that are typically dominated by men. For instance, one of his first students went on to Cal Tech, earned her Ph.D. at the University of Colorado under the direction of a Nobel Prize Winner, and was later recognized as the Woman Physicist of the Month by the American Physical Society, the world’s second largest organization of physicists. “I always get amazed when I see the kids come back and what they’ve done,” Jack said. Born and raised in Los Angeles, Jack attended Beverly Hills High School and later graduated from UCLA, where he earned a Ph.D. in chemical engineering. After graduating from UCLA in 1963, he started working for TRW, which is now known as Northrop Grumman, an American global aerospace and defense technology company. “I had a number of different jobs, pretty much at the engineering level, and then at the middle management level,” Jack said. “I was chief engineer in one of the Groups for awhile, and worked in the space division. And then towards the end of my TRW career, I worked in the space division for the automotive part of our company where we developed air bag systems. One of his greatest contributions at TRW occurred after the Challenger accident in 1986, when the space shuttle broke apart 73 seconds into its flight, killing all seven crew members. Jack’s teaching position at Mayfield also arrived serendipitously. “If it wasn’t for TRW, I probably wouldn’t have ended up here,” he said. At age 61, he had just completed a project working on an air bag inflator, “And I’d wanted to try teaching in high school for awhile,” said Jack, who had done some teaching in college and also led classes at TRW. “I couldn’t teach in the public school system because I didn’t have a credential, so I started writing letters to all the private schools around,” he said. Coincidentally, the husband of one of the math teachers at Mayfield happened to work at TRW. Prior to going to Mayfield, Jack was a member of the Board of Trustees of Marymount College for 10 years and was the Board Chair for three years. Kenny Fisher, a math teacher and track coach at Mayfield, said Jack is an “invaluable” presence on campus. Mayfield is “blessed” to have Jack, who is more commonly known on campus as “Dr. B,” Kenny added. In 1997, Jack was elected to the National Academy of Engineering, and he is the only member of the National Academy teaching in High School. In other involvements, Jack and his wife, Susan, are members of St. Brendan parish in Hancock Park. 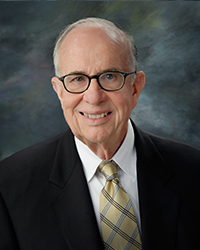 Jack serves on the Catholic Education Foundation’s board of trustees. He also is working to bring iPad technology to inner city schools. “I’m mainly doing it at Sacred Heart High School in Lincoln Heights.” Jack said. After decades of exposure to the Catholic faith, Jack, Susan and Tom received the Sacrament of Baptism in the Cathedral of Our Lady of the Angels.